Product prices and availability are accurate as of 2019-04-23 23:00:54 EDT and are subject to change. Any price and availability information displayed on http://www.amazon.com/ at the time of purchase will apply to the purchase of this product. 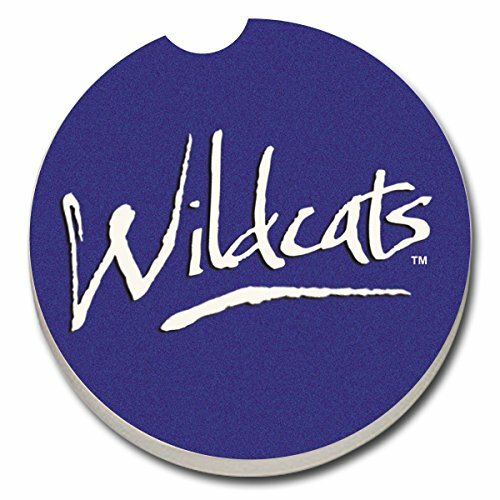 Licensed Collegiate Car Coasters represent most major colleges and universities nationwide. The car coasters are available with traditional logos and popular "Fan" slogan designs. These Car Coasters are an innovative way to keep your vehicle's cup holder dry by absorbing condensation from beverages. The unique finger-slot makes the coaster easy to remove for cleaning. This CounterArt individual car coaster features an innovative design for keeping your vehicle's cup holder dry from beverage drips and condensation. Crafted from a durable stoneware material that continuously absorbs moisture, this coaster has a convenient finger slot on the side, making it easy to remove for cleaning. The decorative transfer print is FDA approved and has an attractive, artistic design that gives you options for your own personal taste. To remove coaster stains, soak coaster in 1 part household bleach and 3 parts water until stain lifts, then rinse and air dry. These car coasters make great add-on gifts and are effect as a stocking stuffer or party favor. Measures 2-1/2 Inch.